We started out to do the "Whitney Basin Traverse" (see Moynier and Fiddler, 2nd edition), but illness (mine) caused us to go slower than required and we cut the trip short. Naturally (see map), we called this shortened version the "Meysan Basin Traverse." We started out in Meysan Canyon and climbed Lone Pine Peak from Grass Lake (class 2). Headed SW to Peak 3985 and bivy'd on the way. Next morning climbed it (class 3) and descended the west ridge (class 4). Then up LeConte (class 4 NE face) and down the Waterfall Pitch route. To Mallory (class 2), and back to LeConte-Mallory Pass for the night. Third day, across the east face of Mallory to Irvine (class 2-3), then down its northeast ridge (class 3) to Candlelight. Finally, we dropped down steep slopes (class 2) to the Meysan Lake trail again, and back to the car. 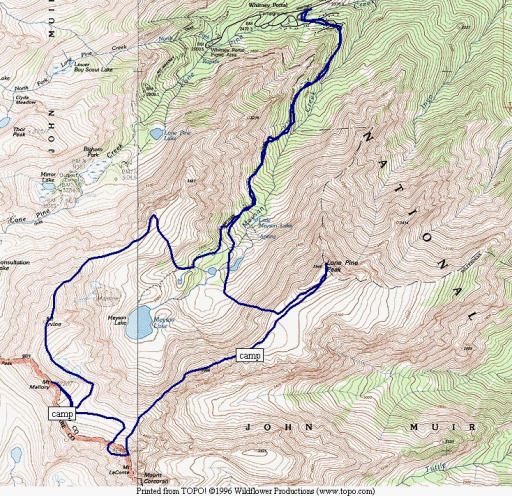 Loop trips are fun, and this one is nice because it circles a major basin and crosses over 6 peaks in the process. This was a China Lake Mountain Rescue Group training climb, and those along were Dan Bishop, Daryl Hinman, Bob Huey, guest Jan Lorenzen, and me. Jan and I skipped LeConte (I was feeling poorly and Jan was sympathetic). Also, I skipped Lone Pine Peak. But the others gained all 6. Of course, we were high the whole time so the views were consistently great.